When most people think of an out-of-this-world bagel experience, Los Angeles isn’t usually the first city that comes to mind, but that doesn’t mean that sunny, Southern California is devoid sublime options. The East Coast might consider themselves the kings of the bagel world (just as they do with pizza), but today we’d like to challenge that assumption. Next time you want to step out of the Los Angeles luxury apartments in search of a spot that can hold its own against any of New York’s best offerings, consider adding some of these favorites to your personal list. Located on Pico Boulevard, Schwartz -- an authentic Jewish Bakery -- brings with it some of that authentic bagel flavor as well. Established in 1954, Schwartz also holds the distinction of being the oldest kosher bakery in town, and staying in consistent operation for more than 60 years is no small feat. Quality baked goods that adhere to the “highest standards of kashruth” are the hallmark of this notable spot, and, in addition, they’ve partnered with a New York Chain, Circa, to further boost their bagel-making cred. As for those bagels, you’ll find them in multiple varieties, along with freshly-made bread, pastries, and other delights to get you through the day. LA-original mini-chain Western Bagel has distinguished itself as a local favorite since its founding in 1958. The story of Western Bagel is an interesting one, a family tale that originates in the early half of the 20th Century. Louis Ustin left Russia to escape the revolution, settling in the Bronx and working as a bagel baker. Since that day, the Ustin family has been deeply devoted to the tradition of providing quality bagels, and exporting their New York style to sunny California. In the years that have followed Western Bagel’s rise to prominence in Los Angeles, they’ve continued to set a high bar for the standard on what a bagel should be, one that you’ll surely appreciate. Old-school style with a new-school twist, Wexler’s Deli has several locations throughout the city, but all are known for their powerful offerings, ranging from delicious sandwiches with “house-cured meats & fish” to, of course, their scrumptious bagels. The brainchild of Micah Wexler and partner Michael Kassar, this growing powerhouse started in Downtown, later expanding to Santa Monica and Century City. They’ve got a firm grasp of the basics -- which include plenty of smoked fish and pastrami -- but aren’t afraid to mix things up with a few interesting innovations. You’ll find Sam’s Bagels peppered throughout the Los Angeles area, and each location is rather familiar with the concept of quality. They’ve been featured on both Eater Los Angeles and LA Weekly’s lists of the town’s best bagels, and both praise the amount of variety you’ll find on the menu. As LA Weekly so perfectly puts it: “Since most people in L.A. aren't from traditional bagel-eating cultures - i.e., not from New York - and therefore don't have specific allegiance to a particular type of bagel, local bakers have had the freedom to make their bagels their own.” Sam’s takes full advantage of this, concocting specialties that will keep you coming back. Head over to Beverly Boulevard, and you’ll find La Brea Bagel Company, a comfy, New York-style joint with plenty of kosher offerings on the menu. 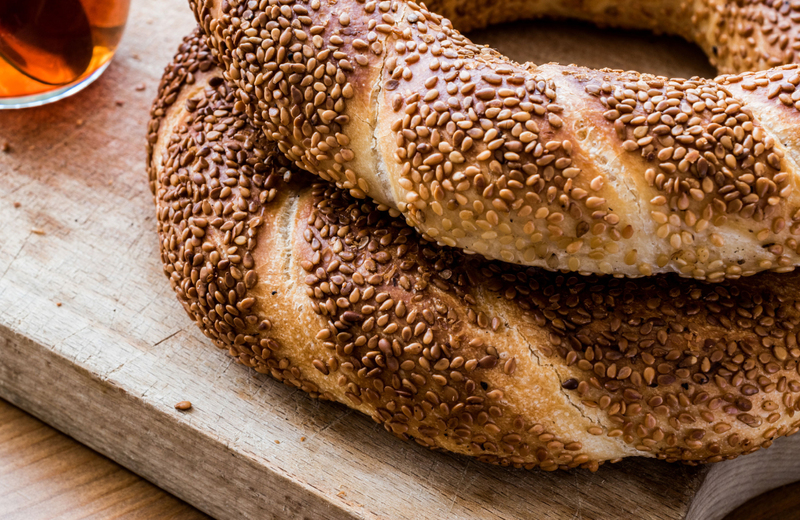 Styling themselves as an “Authentic Bagel Bakery,” this local eatery prides themselves on an adherence to tradition: “Our Recipes are derived from our ancestors in eastern europe when one bagel would satisfy a healthy appetite for an entire day. We boil out bagels (instead of steam), bake on an oak board, then flip them in the oven onto a stone hearth for the authentic La Brea Bagel Co. Bagel that has a crispy yet chewy texture real bagels should.” They say it’s all in the technique. LBBC’s skills will have you right on board with that statement after the very first bite of any of the bagels on their menu. Of course, La Brea aren’t the only ones in town boiling their bagels. New York Bagels LA adheres to a similar tradition, one that has made them a hallmark of the city’s bagel scene. To quote the bagel-masters themselves: “Our delicious bagels and bread products maintained their traditional taste because the dough is mixed and prepared by our artisan bakers who have over 15 years of experience.” Hard to go wrong with a family-owned company with years of experience in the business, and if you’d like to taste the quality for yourself, just head on over to Washington Boulevard (where their bakery outlet is located) to experience the bagel-goodness. If you’re looking for an upbeat, small, and, more importantly, vegan/gluten-free bagel option, Breakaway Bakery on Pico Boulevard is going to be your first choice. No gluten, no wheat, no dairy, no peanuts, no soy, and no GMOs, they say, so you’ll be getting a product you can be certain is passionately crafted and devoid of all the things you’re looking to avoid. Those with special dietary needs rejoice, as you’ll be able to experience these healthier options without fear that they lack for taste. Breakaway Bakery is just as delicious as any other option in town, as you’ll soon see when you head over there and try a few bagels for yourself. While you’re there, make sure you pick up some extra treats like muffins, cupcakes, or cookies -- for the road. And when you’re located at superb spots like Eighth & Grand, getting there couldn’t be easier. Nestled conveniently in Los Angeles’ rapidly evolving downtown area, you’re right near most of the city’s best places to be. Add to that the splendor of its spacious living units and some top-tier luxury amenities, and you’ll be more than ready to grab that delicious bagel from your new favorite hangout and return to your abode for an experience you’re not likely to replicate anywhere else.